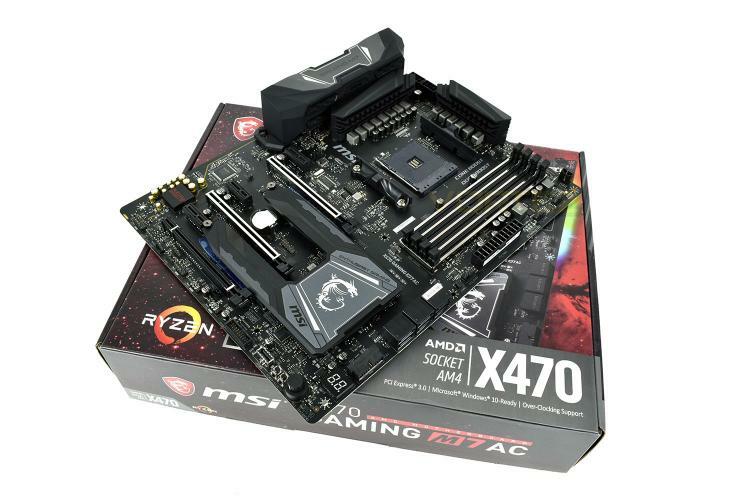 MSI are wasting no time in introducing their motherboards this time around, with the MSI X470 GAMING M7 AC landing in our test labs a couple of weeks ago. We’ve had plenty of time to mess around with settings and get a good look at the feature set. The GAMING M7 AC likely won’t be MSIs flagship model, but it’s their current best offering for the X470 chipset to compliment the launch of AMDs Ryzen Zen+ CPUs, the 2xxx Series. The striking design is difficult to miss, with a dual-purpose southbridge heatsink, named the M.2 Shield FROZR, also offering protection and helping to increase heat dissipation to prevent energy-hungry M.2 drives from throttling. The power delivery heatsinks are also particularly overstated, ensuring the Ryzen CPU receives all of the power it requires while remaining 100% stable. Of course, any modern-day motherboard wouldn’t be complete without RGB lighting. The GAMING M7 AC features two RGB LED lit zones, one above the IO shield at the back and then a bank of 8 LEDs mounted on the reverse side, on the top-right section; illuminating the rear of the DIMM slots against the motherboard back plate. The RGB implementation is arranged by MSIs Mystic Light. Gaming performance is catered for from several different angles; audio is provided by the Audio Boost 4 with included amplifier using premium components. DDR4 memory is isolated from external circuitry, preventing interference and improving performance, while a similar approach is taken towards the two main PCI-E 3.0 x16 ports, with steel armour reinforcement inhibiting bending and EMI. NVIDIA SLI and AMD CrossFire is supported in 2-way and 3-way respectively. Killer E2500 Gigabit GAMING LAN is utilised to give you every chance possible while an Intel WiFi/Bluetooth module provides wireless options. Connectivity is provided through USB 2.0, 3.1 Gen. 1 and 3.1 Gen. 2 as well as 6 SATA 6Gbps ports. Certainly, the MSI X470 GAMING M7 AC seems to offer everything an enthusiast gamer would require, so how does it stack up against the competition? And does the X470 chipset offer performance gains over the X370?